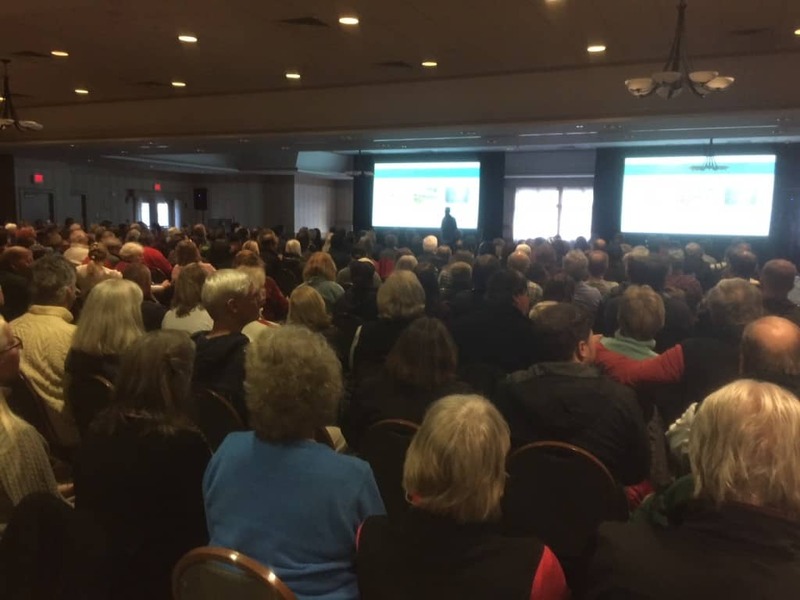 KILLINGTON— On Thursday, March 1, approximately 400 people gathered in the Oscar Wilde Ballroom at Killington Grand Resort for a “Resort Update” presented by Mike Solimano, president and GM of Killington and Pico. The turnout was impressive, with many local business people saying it was the largest crowd they’d ever seen at a resort update. Even Solimano was surprised as folks continued to flood in well after all the seats were filled. “We didn’t anticipate this many,” he said, just before beginning his presentation at 5 p.m. “It’s great to see so many people come out for this,” he added. Solimano begun his presentation outlining planned investments of over $16 million at Killington and Pico ahead of the 2018-19 season. Some of the biggest winter enhancements will include: a new 6-person high speed bubble chairlift at Snowdon ($7.8 million), new lift service at South Ridge, upgrades to the K-1 Express Gondola including new cabins ($2.2 million), hands-free lift access gates at both Killington and Pico ($1.5 million) as well as improved intermediate trails and new ski bridges and tunnels at key intersections. Solimano also presented new investment plans for this summer, including a Ninja-style obstacle course (called WreckTangle), exercise pod and jogging path, and a chocked-full event schedule including the addition of the Mountain Bike US Open Aug. 1-5. Mountain biking has seen the lion’s share of investment dollars and the resort has seen that investment pay off in correlated rider visits. In 2013, before the five-year buildout of mountain biking, the resort reported just 2,000 rider visits, in 2014 it grew to 4,900, then 8,060 in 2015, then 12,000 in 2016 and hit a whopping 23,000 last summer; representing a total growth of 91 percent, said Solimano, showing a chart outlining this growth. A new six-person high-speed, bubble chairlift will be installed ahead of the 2018-19 ski season. The new Snowdon chair, manufactured by Leitner-Poma, features a bubble shield that will protect skiers and riders from wind and weather as they ascend 1,100 vertical feet to the Snowdon Mountain peak, which features primarily intermediate cruising terrain. There also will be a storage facility built to house chairs in inclement weather to assist when weather impedes operations. The ride, “which used to take 10 minutes (and feel like 15)” as Solimano said, will now take just 4.5 minutes to the top. The highly anticipated return of lift service in the South Ridge area will occur with the relocation of the refurbished, Snowdon Quad chairlift. The South Ridge Quad will load and unload in the same locations as the old South Ridge Triple and will have a length of 3,900 feet and a vertical rise of approximately 875 feet. The South Ridge Quad will provide easier access to trails such as Pipe Dream and an additional way to connect back to the north side of the resort from Bear Mountain. In addition to numerous upgrades to the K-1 Gondola in the past few years. Killington will replace all cabins with brand-new Leitner-Poma Sigma eight-person cabins which will be stored in a new cabin storage facility to improve reliability and de-icing time. The haul rope will also be replaced and improvements to the loading area are also planned. All ahead of next season. The K-1 Gondola will continue to run on electricity generated by BioGas, through a program commonly known as Cow Power as part of our commitment to POWDR’s Play Forever using renewable energy. Killington Resort and Pico Mountain will introduce Axess smart gates with RFID (radio-frequency-identification) at lift access points. This technology will improve the guest experience by the use of hands-free automated gates instead of manual barcode scanning. Tunnels, bridges, regrading will improve the experience on several key intermediate trails by limiting trail intersections in high traffic locations and removing pinch points for more top to bottom trail runs. The Snowdon Poma lift will move to Swirl to create a dedicated race training venue for Killington Mountain School and Killington Ski Club. This move will open additional terrain to guests in the Snowdon area and allow for uninterrupted top to bottom skiing and riding. Summer operations continue to expand at Killington Resort with a new Woodward WreckTangle and additional summer attractions to be added to the Adventure Center. The WreckTangle is an outdoor ninja obstacle challenge featuring nine different sections of unique and fun-filled obstacles to conquer including cargo nets, balance beams and rope swings. Additionally, Killington’s Mountain Bike Park will make improvements to beginner terrain, unveil the newly completed Krusty Trail on Ramshead and extended riding hours. For more information visit killington.com and picomountain.com.